Bright color and eye-catching contrast define this simple fall dress that's ready for layering! 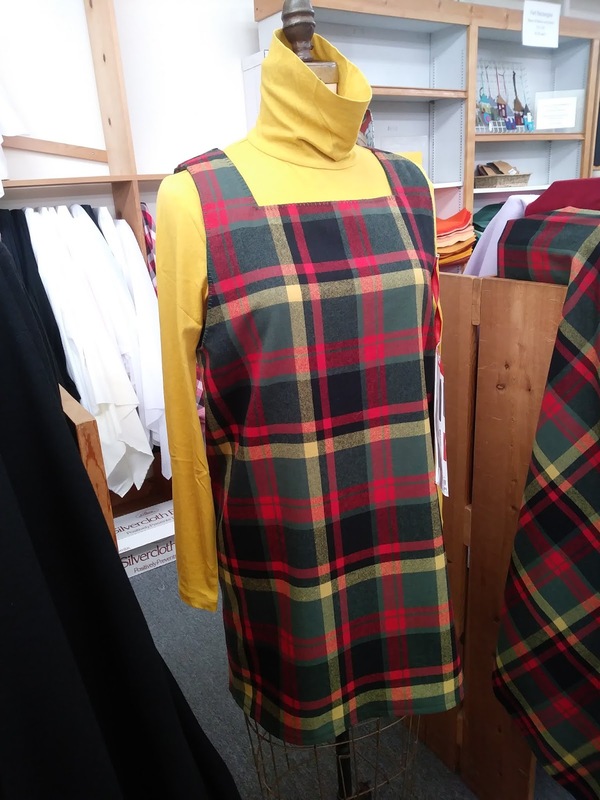 Treadlette Nina made this cute dress using two complementary shades of solid ponte knit with contrast color-block pockets and neckband trim. Nina used New Look 6298, a simple dress with options, including those huge pockets that we all dream of! What are you sewing for fall? Stop in and tell us what you've made, then find an idea for your next project! It's the final three days of our Fall Sale! 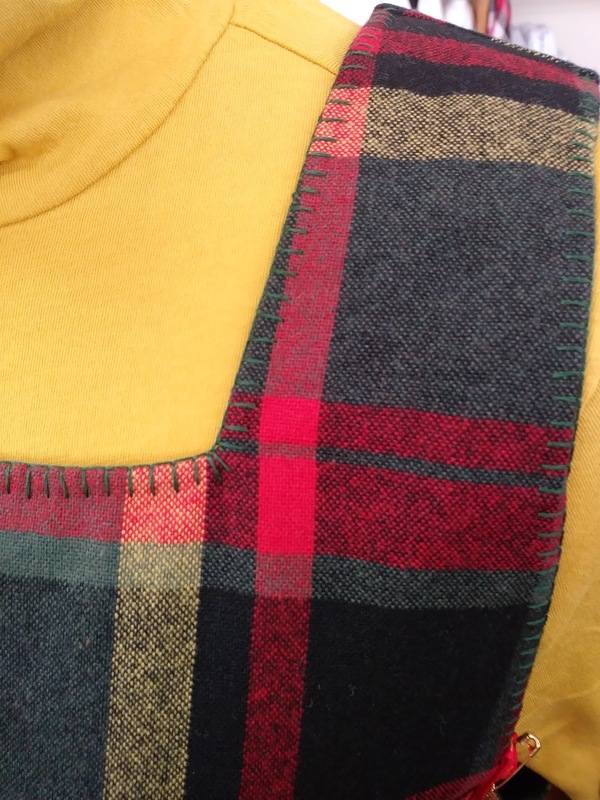 NEW fabrics in just this week: wool, flannel, and seasonal fashion fabric! Stop by and save! Lana Bolito, our favorite boiled wool blend, is back in stock! Pretty fall colors and soft drape with a just a little stretch for cute jackets and cardigans! Today's Treadlette garment is this knit & woven dress made by me, Elizabeth! I chose Burda 6352 (shown below) because I loved the asymmetric shape and the use of both woven and knit fabric. The top is a cotton jersey, while the skirt is a floral printed rayon challis with tons of swishy drape. One note on this pattern: it runs VERY large. I went two sizes down from my usual size in the bust and waist and it was still incredibly roomy. I also cut the skirt just a bit shorter than the long version because I didn't want that front point trailing on the ground! Otherwise, this project was super simple and sewed up very fast! Just right to add to my fall wardrobe! These fabulous new Tula Pink prints from her Zuma collection are in eye-popping neon! The prints are bright and saturated, and they each have an over-print of neon highlights to pump up the color! These deliciously soft knits have a smooth jersey face and a fluffy, fleecy inside! Made from a blend of organic cotton, hemp, and rayon, these knits will make the perfect cozy sweatshirt or jacket! We can't resist these new Japanese prints! Some are colorful and elegant, others just whimsical fun! 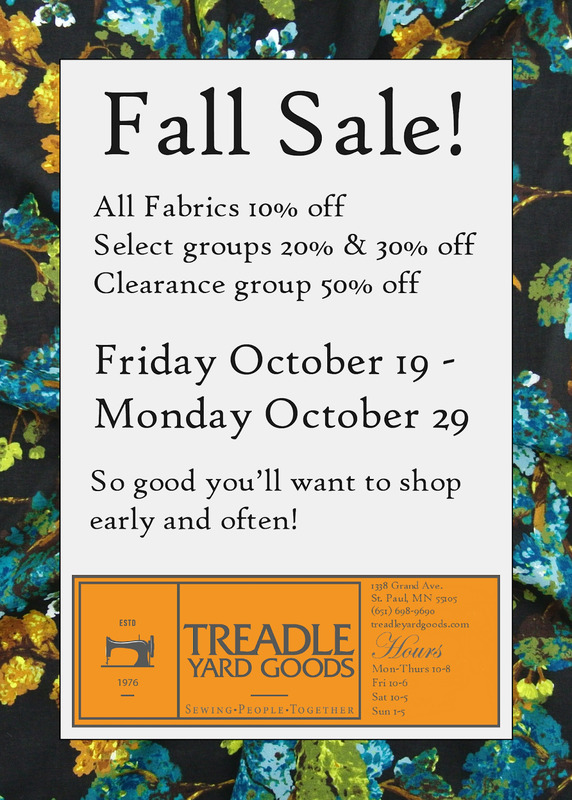 It's Almost Time For Our Fall Sale! 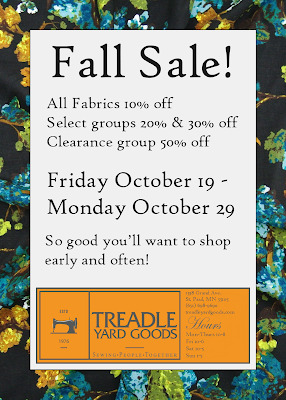 Our Fall Sale starts Friday! Hurry in for great deals on gorgeous fabrics! Halloween is right around the corner! Whether you're making treat bags, crafts, or decor, get in the spirit with these scary prints! This bookshelf is overflowing with wizard's charms and secret scrolls. All the books have magical titles! Make something creepy with these bony hands! This black and white line print is packed with detail. These digitally printed linens have big, gorgeous, realistic motifs on a crisp, lightweight 100% linen fabric. 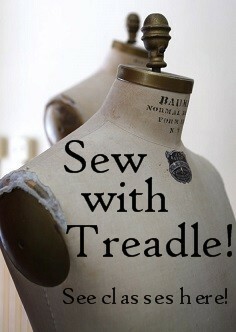 Sew yourself something amazing! We love the bright, whimsical Japanese prints, but here's a calmer, more subtle group that's just as gorgeous! These last two are in a delightfully soft, fine-wale corduroy! Soft new rayon challis prints! These are comfy to wear and perfect for the transitional weather. Lovely prints and a flattering drape make them ideal for blouses, dresses, or skirts! 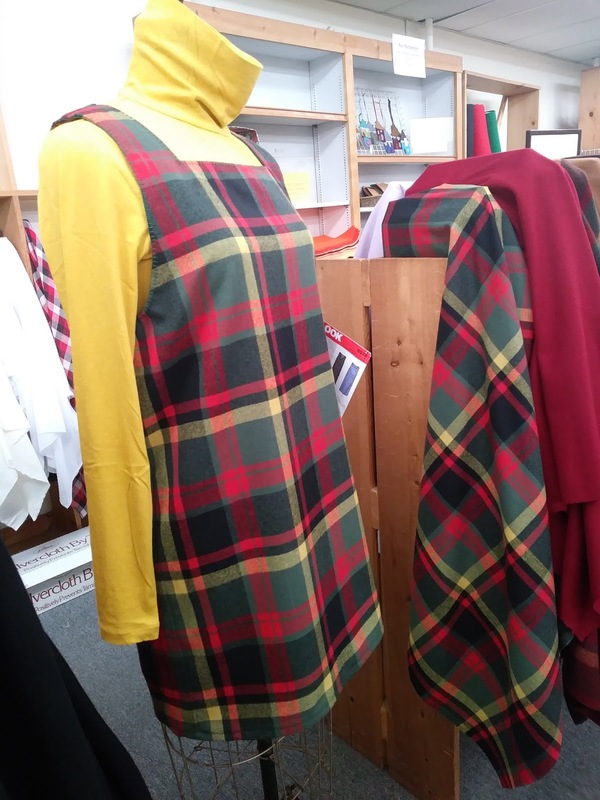 Check out Jennifer's smart plaid wool jumper! She embroidered a blanket stitch around the neck and armhole edges to add a beautiful handmade touch. 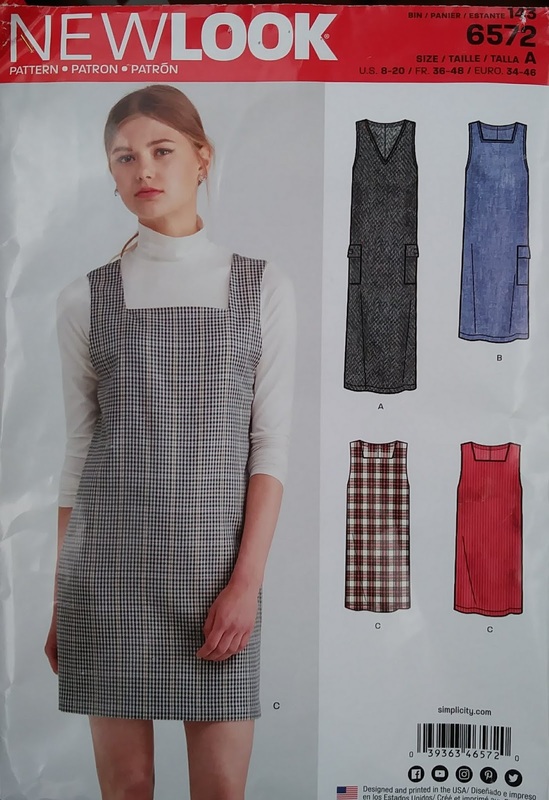 The pattern is New Look 6572, a straight shift shape with options for length, neckline, and pockets. Have you seen the new velvet yet? It's really something splendid! This silk and rayon blend velvet has a lush, deep pile and a soft drape. Any of our new colors would be perfect for a gorgeous autumn garment!